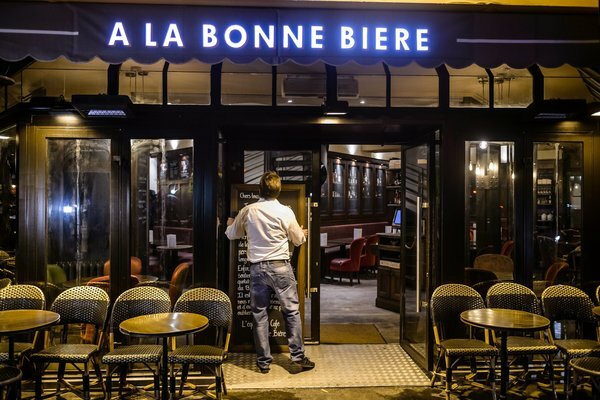 Paris – La Bonne Bierre, one of the cafés hit on the Paris attacks on November 13th, and where 5 people died, reopened for business on Friday. It becomes the first of the six cafés and restaurants hit during the rampage to reopen its doors. The manager, Audrey Bily, said The Bonne Bierre cafe was a place where people meet and exchanged and shared and that its intention is to get that back. The famous café reopening shows the will of the French against the fear of terrorism. Photo: The New York Times. “I would like to thank everyone who has supported us for your poems, your messages and posts that have so helped us,” Bily said. The staff at La Bonne Bierre cleaned up Piles of candles and flowers put in front of the café to make way for wicker chairs on the terrace. Nevertheless, a pile of floral tributes still lines the pavement in front of the bar. Many customers showed up to support the café saying they need to feel that life is resuming, that they must not give in to fear and that they feel good to be there with people who went to the same cafe, the same flower shop, the same bakery. The other restaurants hit during the attack, including the nearby Le Comptoir Voltaire and La Belle Équipe, remain closed. Le Carillon and Le Petit Cambodge, just up the street from La Bonne Bière hope to reopen soon and on Wednesday. Cleaning workers have also begun clearing away flowers from outside the bars. Additionally, two of the Bataclan’s owners said they intended to reopen the theater by the end of next year. As the Parisian try to get their lives back, investigations about the attacks continue. Belgian and French authorities are in the process of hunting two new suspects. Authorities said the suspects used fake identity cards around Europe, and sent money to a relative of the man who arranged the attacks –just a day before the instigator died in a shootout with French police. The two men carried false ID with the names of Samir Bouzid and Soufiane Kayal. They had been traveling in a Mercedes with Salah Abdeslam, another Paris attacks fugitive when the car was checked on September 9th at the Hungarian-Austrian border.